Momma on a Mission: Marketing Strategies: Also for three year olds. "Mommy, does that check mark mean that this is healthy?" Those are the words that came out of my three year old's mouth when we were on the cereal aisle at the grocery store. We've been talking a lot about healthy and not healthy foods lately. She knows that healthy foods are good for her body, and that not healthy foods could make her get sick. And at the tender young age of three and a half, the marketing techniques of General Mills are reaching her. We made a major overhaul on the kids' diets about two months ago. As you know, I've been on the GAPS diet since just after the first of the year, and I've seen some pretty incredible improvements in my health. When I first started out, I was the only one doing the diet. The DH wasn't particularly interested(and didn't have any pressing health issues that he was concerned about), and since the diet is fairly difficult to get started on I wanted to get adjusted to it first before I thought about getting the kids involved. That didn't last long though. I couldn't stand feeding my kids food that I knew was going to damage their gut and their health, particularly the gluten and sugar! I couldn't justify feeding them food that I wouldn't dream of putting into my own body. It was hard, but I planned ahead and we went cold turkey, completely removing grains and all sugar(except fruit and honey) from their diets. The first week was really tough, but we all made it and have seen significant results! Naturally, as we made such big changes to the kids' diets, we did a lot of talking about what we were doing and why. I did a lot of explaining about how healthy foods helped your body to grow strong and how unhealthy foods were bad for your body and could make you get sick. The last time Hayden had a doughnut, instead of just dealing with the meltdown that followed, I decided to explain to her what was happening and why she felt the way that she did. She ate the doughnut, and then about 15 minutes later had an absolute meltdown. Nothing tragic had happened, but because of the sugar in her system she totally overreacted and started sobbing. I calmed her down a little, and then explained to her that she was feeling so sad because of the doughnut that she just ate. I explained that the doughnut had a lot of sugar, and that when she eats a lot of sugar it makes her feel really yucky and sad. Her eyes got really big, and she thought about it for a minute, and then said, "But doughnuts taste really yummy!" I replied, "Yeah, I think they taste really yummy too! But the problem is that they taste really yummy in your mouth, but then when they go down to your tummy they make you feel really yucky, and they could make you sick later too." I know she's young, but I could really see the wheels turning as she thought about it, and she seemed to really understand the concept. The more that she understands about what foods to eat and why, the more empowered she'll be to make the right choices herself, even when I'm not there to guide her. For the next several weeks, she'd ask this about nearly every food, "Does this have sugar in it?" Even Tristan asked a couple of times. We'd talk about nearly every food item that she saw. "Is this healthy?" "Does this have sugar in it?" "Could this make me sick?" We did a lot of talking about healthy food and unhealthy food. Then one day as we were watching tv, she saw a commercial for some kind of processed "health food". She heard the advertiser talking about how healthy the product was, and she said something like, "Look, mommy, that's a healthy food! Can we get that?" Oh boy. This is exactly what these big food companies want you to think!!! 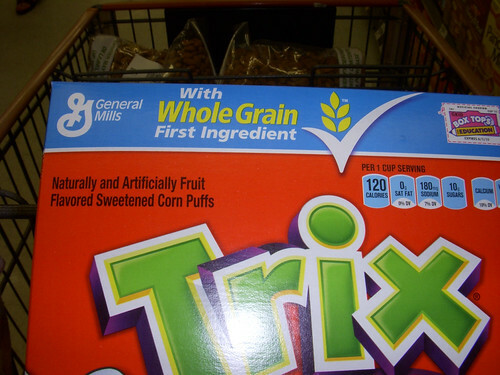 "Healthy whole grains" are not healthy! Processed food in a box or bag is not healthy! 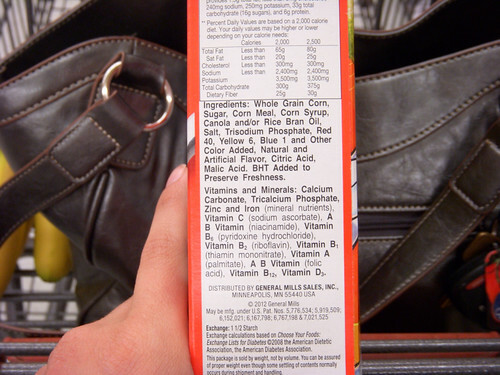 Grains and sugar with added vitamins are not healthy! These things will not nourish your body. I explained to Hayden that these foods are actually NOT healthy, but the people that make the food and the people that are on tv are lying to us, telling us that the food is healthy so that we'll buy it. She laughed, and thought that was pretty funny, and we talked about how it's not good to tell lies. So then as we're at the grocery store, she asks, "Mom, does that check mark mean that it's healthy?" What a perfect teaching moment! I explained to her that, just like the commercials on tv, the people that make this cereal are lying to us, wanting us to think that their product is healthy when it's really not! I showed her how we could turn the cereal box around to look for ourselves at the ingredient list to see if it was healthy or not. I read, "Corn, that's not healthy. Sugar- is that healthy for your body?" Hayden shook her head no. "More corn, and then corn syrup, which is just another name for sugar! More sugar! Is this sounding like something that we should eat?" Hayden: "Nope." Then I got down near the bottom of the list and started reading, "Red 40, Yellow 6, Blue 1, and other color added. Those are colors! Are we supposed to eat colors?" Hayden started laughing really hard. "Mom- that's not food!" I said, "You're right, it's not! Colors are for coloring with, like with your markers. They're not even food- why would someone want to put those in cereal and eat them?!?" We had a good laugh and decided that the cereal wasn't a good choice for us to eat. Marketing techniques are powerful, especially the ones targeted at kids and the ones that want us to believe that anything out of a box is good for us! Don't fall for it! 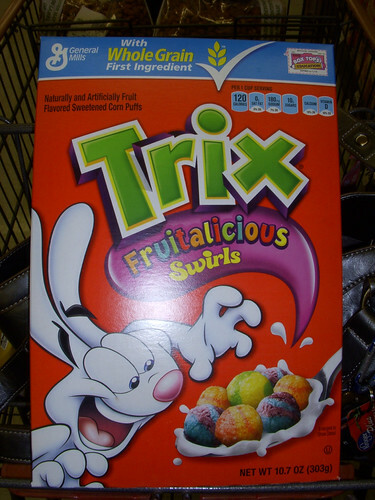 No matter how fun the box looks, this cereal is not a healthy choice for anyone's breakfast, much less a child's. When your child starts to ask for these types of foods, I challenge you to consider using the situation as a learning experience for your child, instead of buying it for them because the package looks exciting. Consider teaching them about how marketing works, why the food they're asking for isn't a good choice, and how to read an ingredient list for themselves. Not only will they be a little healthier now for having not eaten the food at question, but they'll have learned valuable lessons that will be useful throughout their entire lives! Have you noticed your children picking up on marketing techniques? How do you handle that in your family? This is really interesting post. I have just started talking with my 2 year old about sugar and how it makes me and him really grumpy. At least he doesn't even know what cereal is - he knows that eggs are what you eat for breakfast and they get laid by our chickens! Great post! We do not eat any processed foods that are not organic or that contain non-food items and fillers. We try to stick to raw, whole foods, and I love reading about other people doing the same!